Fezes are felt, cone-shaped, brimless hats with a flat top. 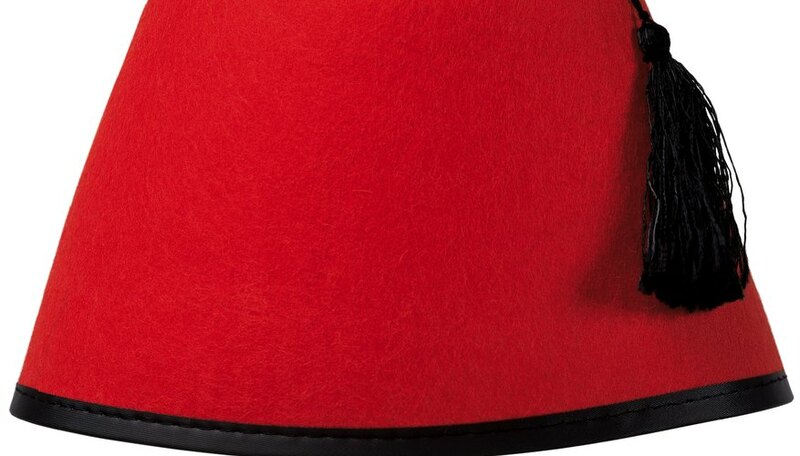 Fezes are usually red and have a tassel. Abroad, fezes are typically worn by men in the Middle East. In the West, fezes are typically worn by those in religious or social orders. If you like the look of the fez and you want to make a small version for your child or pet to wear, all you need is an empty ice cream container and a few other craft materials. Wash your ice cream container to remove any traces of ice cream. Let it air dry. Place your ice cream container onto a corner of the piece of felt. Trace the bottom of the carton. Cut out the circle. Wrap the carton with the rest of the felt. Cut off any excess, but leave a little overhang where the edges meet at the seam and at least 1 inch of overhang on the top and bottom of the container. Glue the felt to the container with your glue gun. Poke a hole in the center of the ice cream carton and the circle you created in Step 1. Turn the ice cream carton upside down and place the circle on the carton. Use the skewer to thread the tassel through the holes in the carton and circle. Flip the carton over once some of the tassel is through the hole. Tie a knot in the tassel on the inside of the container to secure it. Flip the carton back over and glue the felt circle to the bottom of the container. Since this craft requires the use of a glue gun, be sure to take all necessary safety precautions. Mike Jones is an Atlanta native who has been writing professionally since 2000. He has written a number of entertainment, health and how-to articles for online publications such as eHow and Answerbag. He holds a master's degree in journalism from Regent University.